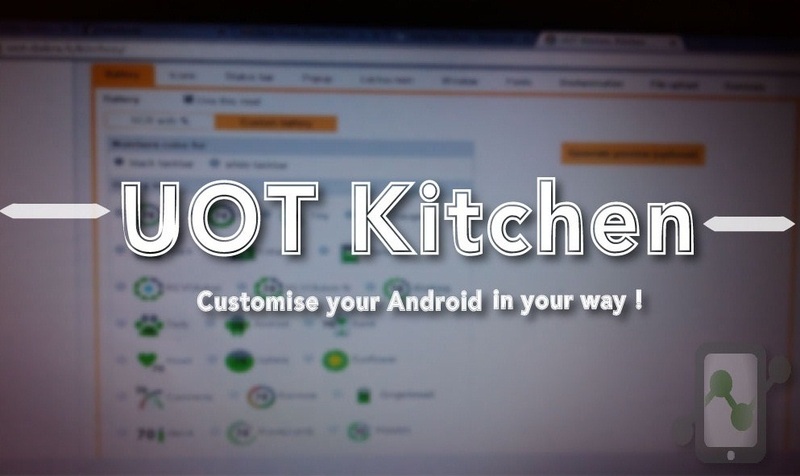 UOT Kitchen – Customize your Android in your way! If you didn’t found few things of your choice in a custom ROM or want to customize your Stock Android, UOT kitchen would be the perfect place to customize your Android the way you want. 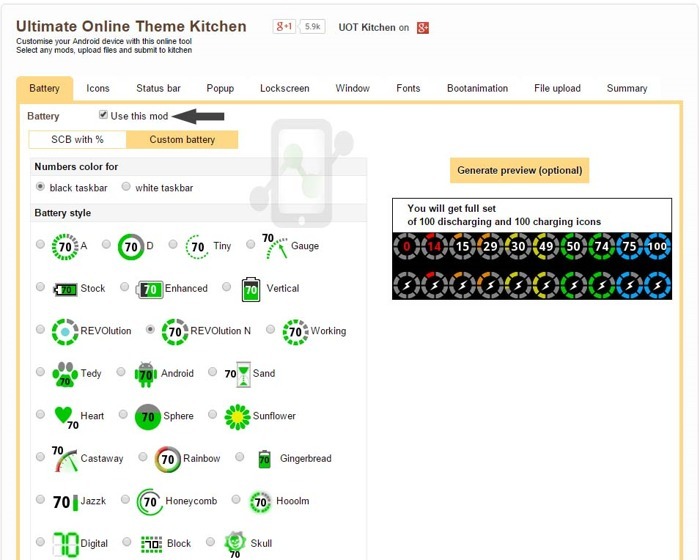 UOT Kitchen is an online tool to customize your android device for free. You can customize every single component of your Android device such as Battery icons, status bar, Lock screen, Fonts, Boot animation, Popup windows, etc. You need to upload few system files of your phone & you are all done! First of all go to UOT Kitchen . You will see many tabs such as battery,icons etc. You can select the mod which you want to use,it’s not compulsory to use all the mods.if you want to use battery mod then go to respective tab. Check use this mod. There are number of options available to change the battery icon.You can also set the different colors for different percentage levels. For example 80%-60% Blue, 59%-30% Blue and 30%-10% Yellow and below 10% Red.There are also different charging animations available. You can also change Emoticons,Power buttons. Just check the mods which you want to use. One of the best part is you can customize your status bar with your color combination.You can also make status bar transperant.You can customize Top bar,carrier name, Header, Background, notification, quick setting tab. Window customization means the way in which new window appears in your device.You can always see the preview before selecting any mod. They have provided videos for different windows animation so you won’t be confused. Install original HTC BlinkFeed Sense 7 of HTC M9 in any Android without rooting. Install Sony Xperia Z3 Walkman in any Android (Rooted/Non-Rooted). You can also customize your Boot Animations. There are more than 20+ boot animations available. Just select your boot animation,watch the preview and go ahead. One should not miss ” Linux Bios”. After completing your customization, Go to File upload tab then go to upload your own files section and select SystemUI.apk and framework-res.apk. Where to Find the above files? Framework-res.apk basically contains the elements of the Graphical User Interface for the phone. This file is available at /system/framework/framework-res.apk. You will see two colors green and red. Green color states that you have used particular mod and red means you have dropped that Mod. Just one more step, Go to summary section and select “Submit work to kitchen”. That’s it.Your zip will be available to download in one to two hours,depending on the orders and mods you have used. 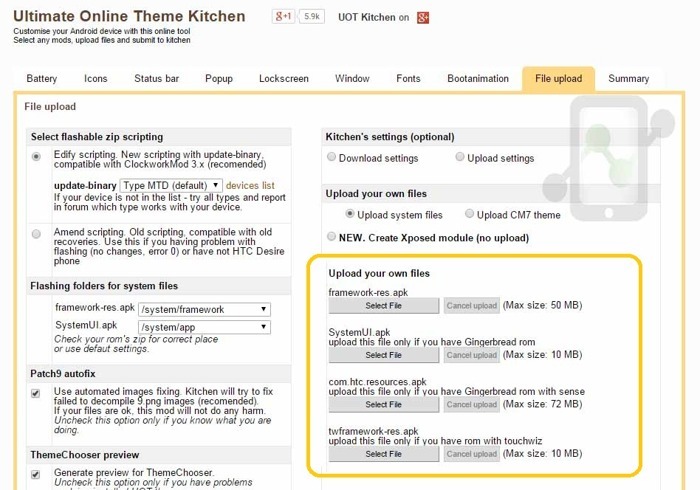 UOT Kitchen is a good alternative to customize your android. Though custom ROMs are good,one cannot edit the ROM without basic knowledge. So let’s experience UOT kitchen.